Drumsticks Keychain – Take a pair of drumsticks with you wherever you go with this cool miniature drumsticks keychain. If you’re a looking for a wonderful music gift for a drummer, this is an inexpensive idea! The miniature drumsticks are made from sturdy, solid polymer and are attached to a single metal ring. Drummers everywhere will love to show off their musical passion! Two drumsticks on one keyring. Each drumstick is approx. 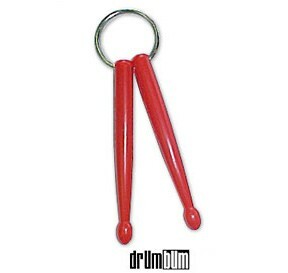 3.5″ L.
Cool Drum Keychains at DRUM BUM!